We’ve been seeing an increase in the spread of fake news and conspiracy theories. Many of these conspiracy theories spread hate against particular groups in society. They then portray any effort to prevent this spread of hate not as an effort to protect groups and individuals whose human dignity is being attacked, but rather as part of a conspiracy to “silence the truth”. This idea is also picked up in the QAnon conspiracy theory which promotes a “deep state” conspiracy. Conspiracy theories that promote the idea of the person spreading them as some sort of victim / resistance fighter are designed to make any action against them appear illegitimate to their followers. It encourages supporters to ignore those trying to enforce the rules of platforms, the norms of society or the laws of nations.  It isolates their followers from any rational discussion as they claim persecution by unknown powers rather than considering the harm they are causing and why such content may have been removed in the first place. This briefing looks at a case study of a user promoting conspiracy theories. 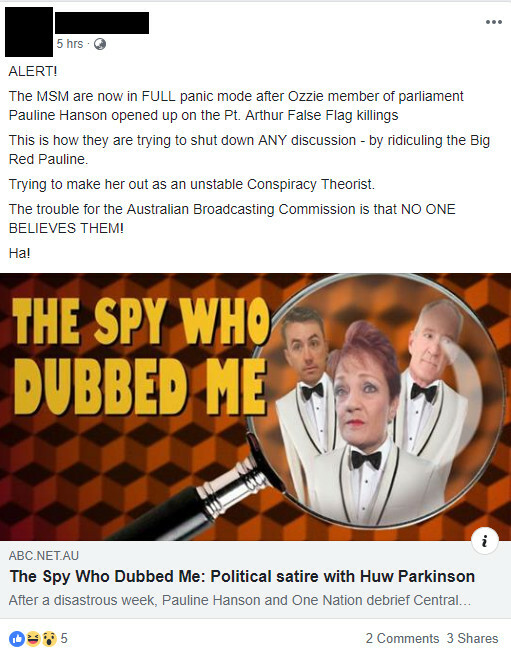 The content is from the profile of a person from Queensland who claims to be an officer of a minor political party that has contested seats in the Australian Senate but does not currently hold any seats. 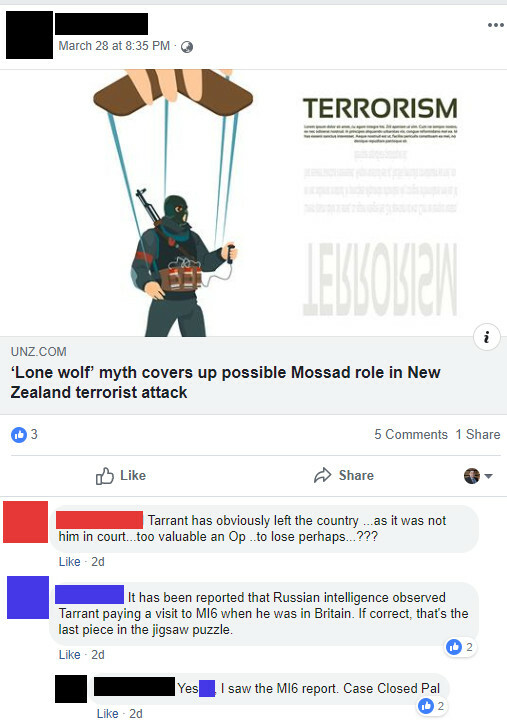 Less than two weeks after the terrorist attack in New Zealand killed 50 people (see OHPI’s analysis), this user shares a link to a conspiracy article claiming Israeli intelligence services are responsible for the attack. In the comments someone suggests it is a British intelligence (MI6) operation. The person we are profiling appears to support this conspiracy theory. These conspiracy theories are based on fantasy and an irrational belief that everything must be part of some deep state plan to manipulate the public. In this case the manifesto makes clear the killer motives, a mix of white supremacy and Islamophobia inspired by the Counter Jihad Movement. A post attacks the media and, while supporting Pauline Hanson, speaks of the Port Arthur massacre which led to Australia’s gun control laws as a “False Flag”. This is a form of conspiracy theory in which attacks are said to have been black ops either run by the government or faked by the government when no attack took place. The promotion of Australia’s largest massacre in recent history (i.e. outside of the massacres of Indigenous Australians during colonisation) as a “false flag” will be deeply offensive to the families of the 35 people who were killed and all those others who were caught up in the attack. A post promotes an anti-vaxx conspiracy theory linked to “big pharma”. The image in the post, by omitting critical facts, distorts and misrepresents information. As discussed in the Journal of the Royal Society of Medicine the “Cutter Incident” involved an early failure by Cutter Laboratories in the manufacturing process of a vaccine. The casualty figures in the image are correct, but this is not representation of either a working vaccine at the time, or of vaccination today. 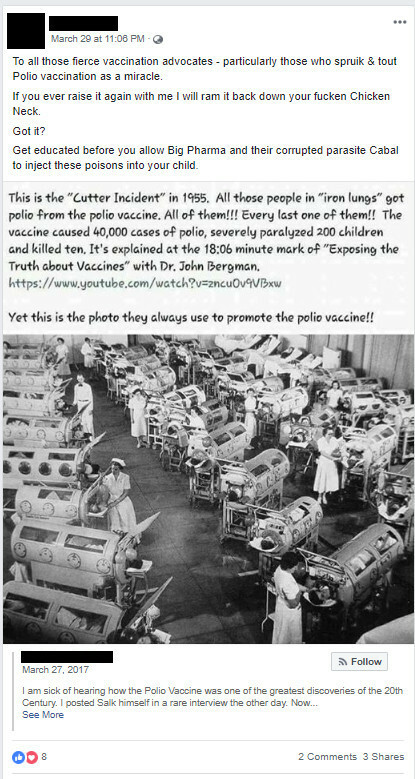 As the journal explains, at Cutter Laboratories in 1955 “the process of inactivating the live virus proved to be defective” and in response the “effective federal regulation of vaccines” was developed and vaccines now have a safety record “unmatched by any other medical product”. The “Big Pharma” conspiracy makes little sense when you realise only 2% to 3% of pharmaceutical company markets relate to vaccines. For a long time manufacturing vaccines was also not particularly profitable and while this is changing it is a result of higher prices and greater take-up including through UN programs. A post calls the Pope a “freak of nature” which may be regarded as anti-Christian hate speech. 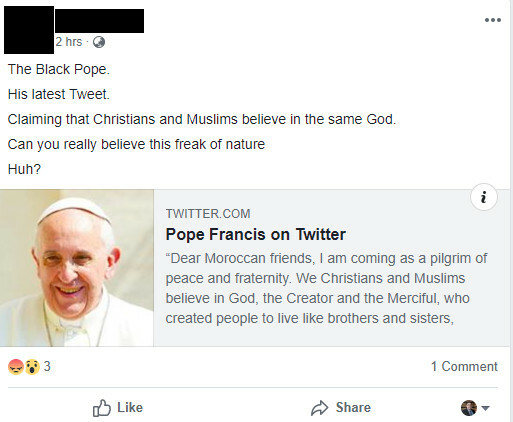 It also refers to him as the “Black Pope”. The “Black Pope” is a nickname for the head of the Jesuits, a Roman Catholic religious order often linked to conspiracy theories. Pope Francis is NOT the head of the Jesuits, that is Arturo Sosa. This link of the Pope to conspiracy theories is another form of anti-Christian hate. 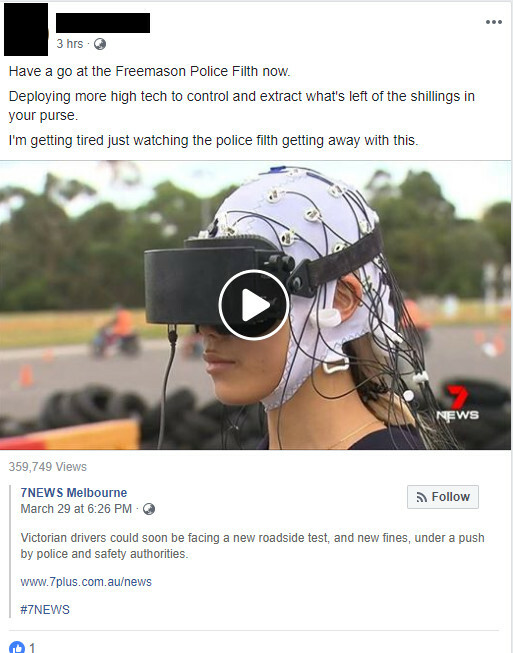 A post attacks the police in response to a news story that researchers are developing a tool for measuring fatigue and the hope is to develop a roadside fatigue test similar to exist drug and alcohol tests. In the video, Victoria’s Road Safety Minister, Jaala Pulford, explained fatigue is a factor in around 20% of road accidents. The post refers to “police filth” twice (attacking the police) but the first time calls them “Freemason Police Filth”. The Freemasons are another group regularly linked to conspiracy theories.